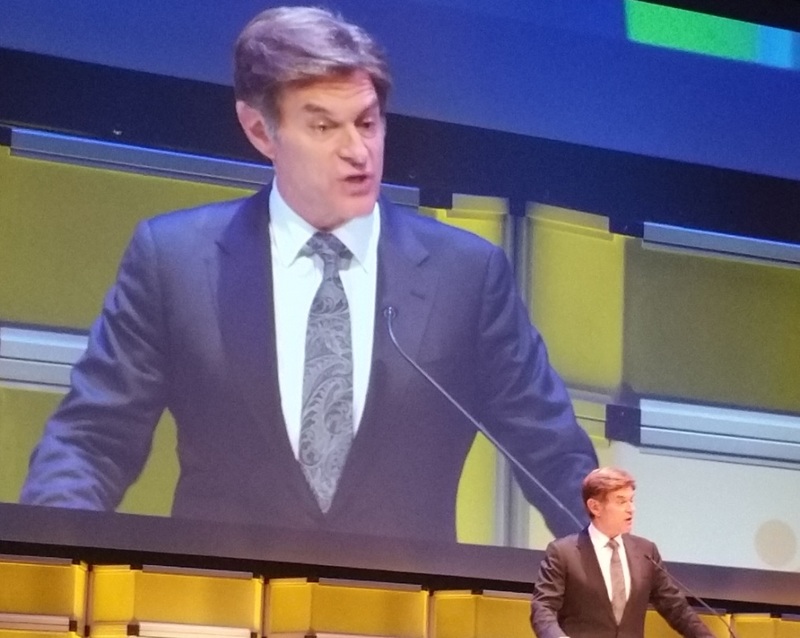 Dr. Mehmet Oz of “The Doctor Oz Show” hosted the Voice Awards. This year’s Voice Awards put a spotlight on the crucial role families play in helping people overcome mental illness and substance use disorder. The Substance Abuse and Mental Health Services (SAMHSA) Voice Awards ceremony, held Aug. 10 at UCLA’s Royce Hall in Los Angeles, go to individuals, films and TV programs that raise awareness about mental health and substance use disorder. These are serious issues in the United States. About 44 million Americans over the age of 18 have experienced a mental illness and 22 million Americans struggle with a substance, or drug use, disorder. However, many do not reach out for help due to stigma or because they do not know what resources are available. Often families are the most important advocates for people living with a mental illness or substance use disorder. Many Voice Awards recipients exemplified this. Shari and Garen Staglin and their family, who received a Lifetime Achievement Award, discovered there was little research on schizophrenia when their son Brandon was diagnosed with the disorder in 1990. So the Staglins, who own a vineyard in Rutherford, CA, launched a music festival to raise money to study schizophrenia. They have raised more than $225 million over the past 20 years. 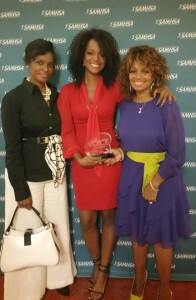 Rebbie Jackson with daughters Yashi Brown (center) and Stacy Brown-Salas (left). The Voice Awards also showed that mental health and substance use disorder affects Americans from all walks of life, even celebrity families that some people believe live charmed lives. Reiner’s son Nick struggled through substance use disorder for “a lot of dark years,” including stints of being in rehab or homeless, Reiner said. To aid his recovery Nick worked on a screenplay with Matt Elisofon, whom he met in rehab. Rob Reiner eventually directed their film “Being Charlie,” which looks at the difficult recovery of a young man living with drug addiction. Rebbie Jackson-Brown and her daughters Yashi Brown and Stacy Brown-Salas became mental health advocates after Yashi was diagnosed with bipolar disorder. Rebbie Jackson-Brown has appeared on numerous TV shows to talk about her family’s experiences with Yashi and promote suicide prevention. Check out the full list of 2016 Voice Award Recipients! And Yashi has told her story to myriad news outlets, holds poetry workshops in psychiatric facilities and schools, and is board treasurer for Project Return Peer Support Network, the largest peer support association of its kind in Los Angeles County. “It’s important to me for people to know recovery is possible,” said Yashi, who has credited her sister Stacy Brown-Salas with encouraging her eto seek treatment at UCLA where coincidentally the Voice Awards are held. NASW’s Suzanne Dworak-Peck and Voice Award recipient Sheldon Hill. 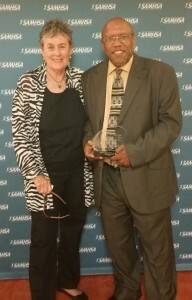 The National Association of Social Workers (NASW), NASW Foundation and the NASW California Chapter are Voice Award partners and past NASW President Suzanne Dworak-Peck, MSW, presented a Consumer/Peer/Family Leadership Award to Detroit resident Sheldon Hill. Hill overcame addiction to alcohol and other substance misuse to become a mentor, motivational speaker and president/CEO of S.D. Hill L3C. S.D. Hill L3C is a community service organization dedicated to serving low-income and other individuals needing coaching and support for recovery from addictions and associated disorders. Social workers account for the largest group of mental health care providers in the United States and Dworak-Peck said she was honored to present the award to Hill. Hill said he felt blessed to be alive after years of living with addictions and in the position to help hundreds of others overcome substance use disorders. VOICE AWARD EXTRA: When NASW Past President Suzanne Dworak-Peck walked on stage to present an award host Dr. Mehmet Oz praised social workers, saying there is no healing in hospitals “without social workers and nurses.” Oz later told NASW staff at the Voice Awards that he never works in hospitals without having a social worker on his team.